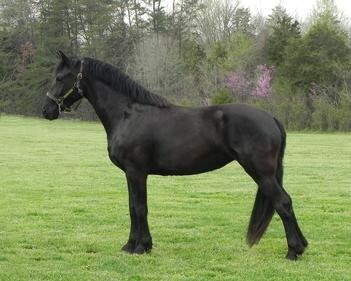 Friesian horses, or Frizian horse, are a horse breed that originated in Friesland, which certainly makes sense. FYI: Friesland is in the Netherlands. They are used both in harness and under saddle and most recently they are being used in dressage. They are black with some occasional white marking; however, the only white marking allowed on a studbook-registered horse is a small star. They are 15.2 to 16.0 hands tall on average and weight 1300 + pounds. Friesian horses have the conformation of a light draught horse; however, they are very graceful and nimble for their size. There is some evidence that during the Middle Ages, ancestors of Friezian horses were in popular as war horses since they were big enough to carry a big heavy guy in metal armor, while nimble enough to dance around foes. Unfortunately, Friesian horses nearly became extinct on more than one occasion. Luckily these days Friesian horses are growing in numbers and popularity. There are currently more than 45,000 Friesians registered worldwide. Approximately 8,000 of those horses are in North America.